What Color Blooms Do Snapdragon Flowers Have? Tall and dwarf snapdragons both bloom in bronze, red, red-violet, orange, yellow, white, blue-violet, purple, bi-colored and mixed colors. Tall snapdragons also can be pink. Watch the snapdragons for the first round of blossoms that will occur early in the growing season. When you see these blossoms begin to fade, cut them from the plant with the pruning shears immediately under the blossoms. Place the spent blossoms in the bucket to collect them as you remove them from the snapdragon plants. Dump the spent blossoms into a compost heap (if you have one) to use them to create beneficial compost to amend your soil. Continue to watch the snapdragons as the growing season progresses, and remove the blossoms immediately when they fade on the plants by cutting them off with the pruning shears. Collect seedpods from the snapdragon. Seedpods form where the flowers grew after the blooms on the snapdragons dry out. Pull the seedpods off the plant and cut them open to remove the seeds from inside. Store the seeds in a cool, dark place until they are due to be planted indoors, two months prior to the last winter frost. Freeze the seeds in your freezer for two days before planting. Fill a flower pot with standard, moist potting soil. Fertilize with a light fertilizer designed for potted plants to help the snapdragon seeds sprout. Sprinkle the seeds of one pod lightly over the surface of the soil, but do not bury them. If you have more than one pod to grow, plant them in a separate flower pot. The snapdragon seeds will germinate in one to two weeks. Keep the growing snapdragons inside on a full-sun windowsill until the last frost. Keep the soil lightly moist at all times. Continue to fertilize once monthly to encourage the growing snapdragons to flower. When the weather turns warm, after the last frost, transplant your propagated snapdragons outside. Examine the blossoms of a snapdragon closely. 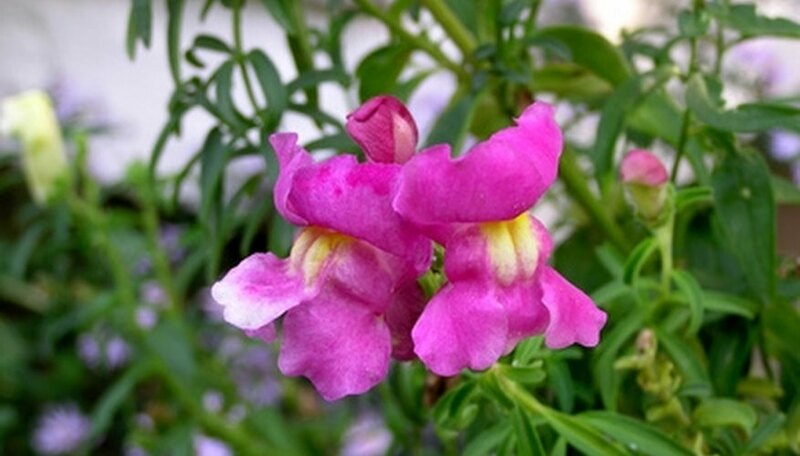 Snapdragon blossoms may be white, yellow, pink, red or maroon (but never blue or violet). The blooms grow in clusters along the tops of the stems of these flowers. Snapdragon flowers open slowly as the flowers bloom to reveal blossoms that move to open and close. Look for dwarf snapdragon varieties that range between 6 and 15 inches in height. Middle-sized snapdragons range between 15 and 30 inches in height. Tall snapdragons may reach as high as 4 feet tall. Notice that snapdragon foliage is a vibrant green color. The leaves are narrow and pointed, and they grow up and down the entire flower stem to cover the stems with attractive foliage. Find snapdragons growing prolifically in sunny flower gardens. They typically bloom during the entire growing season. Gardeners often stake the taller varieties to keep them erect in a flower garden. Dwarf varieties are excellent as borders, accent plants around rocks and in pots. Taller types are good cutting flowers that might need staking. Snaps are well-suited for rich soil and prefer regular fertilizing. A hardy, drought-tolerant plant, they survive in well-draining or dry conditions. Snaps thrive in full sun but will grow in areas with mostly sun throughout the day. Most varieties of snaps drop their flowers after they have been pollinated by bees, with new buds forming above, making them a favorite cut flower for indoors. Deadheading helps with new blooms because the plant can concentrate on new growth instead of expelling withering flowers. Support might be needed for tall varieties. Snapdragons reseed in cooler zones and grow as a perennial in warmer zones. They bloom from early spring until frost. Snapdragons are available in just about every color, in solids and blended shades. Deadhead the snapdragons throughout the summer blooming period. Cut the dead or withering blooms off the plant just beneath the flower with a sharp, clean knife or gardening shears. Cut back the entire plant in mid-summer when the snapdragons begin blooming less profusely. Cut the plants down to 6 inches tall and dispose of or compost the garden debris. Fertilize the snapdragons immediately after cutting back with a phosphorus-rich flower fertilizer, which encourages further blooming on the flowers. Follow the fertilizer label instructions for dosage. Water thoroughly after trimming and fertilizing, providing approximately 1 inch of water per plant. Plant snapdragon seeds in a sunny area outdoors in all-year warm climates. Scatter the seeds and water well. Keep the ground moist for several weeks. Alternatively, plant seeds indoors in a small planting tray with all-purpose potting soil. Scatter the seeds, water lightly, cover them loosely with plastic wrap and place in the sun. It will take between 8 and 12 weeks before you can move the climbing snapdragons outdoors, so plant them indoors 8 to 12 weeks before the last frost. Dig holes as deep as the root and several inches wide. Plant multiple climbing snapdragons about 6 feet apart. They will grow to fill in the gaps over the next few seasons. If planting in a hanging basket, plant several snapdragons together in one pot. Thin the snapdragons out, as necessary, as the vines may naturally multiply. If you planted seeds outdoors, thin them out after the seedlings begin to grow so there is one plant per 6 feet. Water periodically, especially during dry spells in the warmer months. Deadhead snapdragons as soon as the flower begins to wither and turn brown. Spend a few minutes deadheading the snapdragons once or twice every week. Pinch the stem between your thumb and forefinger, down to the next leaf, bud or stem to avoid leaving a stub. If the plant is getting leggy, pinch down a bit further, removing two or three leaves. Discard the deadheaded blooms and don't allow them to pile up under the plant; wilted blooms and other debris can attract slugs, insects and mildew. Toss the blooms on your compost pile or in the garbage. Choose a site that has full sun (afternoon shade in warmer climates) and well-drained, fertile soil. Plants can be planted in the spring after the last frost or, in Southern areas of the United States, in the fall. Dig a hole with the trowel and place it in the hole. Fill in the soil, compacting as you go to remove any air pockets. Water generously. If planting more than one, space them 6 to 8 inches apart. After young plants are about 3 or 4 inches high, pinch back the stems with your fingers to encourage a bushier plant that will yield more flowers. Remove any spent flowers throughout the growing season by pinching them off with your fingers. This will keep the plant flowering well into the fall. To keep your snapdragons for the following year, leave the flowers intact after the last bloom. These will go to seed. New seedlings in the spring can then be transplanted elsewhere.